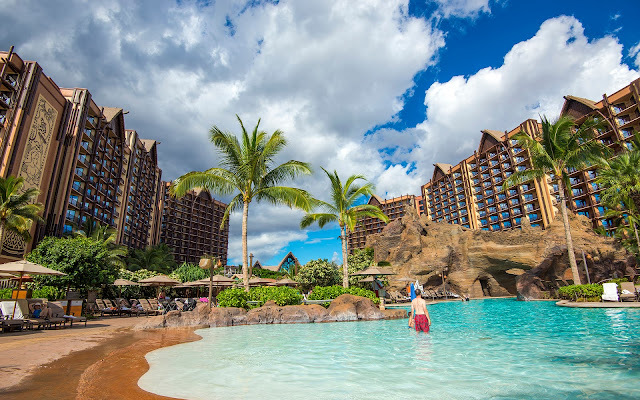 Last week, while on vacation in Hawaii, I had the opportunity to visit Aulani, the magnificent, all-inclusive resort that Disney built on the west side of Oahu. It was a gorgeous day, the type you expect while vacationing in paradise, and naturally, I snapped an inordinate amount of photographs. You'll be seeing lots more in the upcoming months, but I wanted to share a few of them today to give a sense of the grandeur and splendor that Disney has crafted. The main pool stands in the middle of the two hotel towers, which provide a dramatic backdrop. I must admit that I was initially skeptical about Aulani. The idea of crafting a resort themed to Hawaii... in Hawaii... seemed odd. Sort of like building a theme park devoted to the sights and attractions of California in the state of California. And frankly, Disney California Adventure did perform poorly initially--in part because a lot of the general public shared the sentiment. After all, if you're already there, why not explore the real thing? The resort has its own beach overlooking the Pacific--a prime spot for spectacular sunsets. But the immersive and incredible theming and atmosphere is very impressive. And as it turns out, there actually is a strong initiative to be a teaching resort that enlightens guests on the customs, culture, and ways of Hawaii. There are a fair share of shows and attractions, but the idea is not to keep guest perpetually trapped inside the hotel grounds (though with such beauty, it would definitely be hard to leave!). 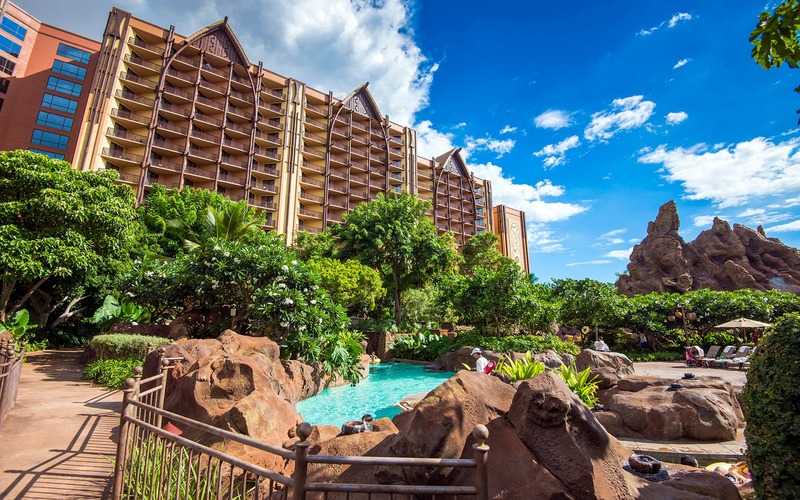 Cast members are certainly keen to suggest attractions and activities all over the island to further experience the essence of Hawaii. There is an awesome lazy river that winds its away around the central courtyard space. In my limited time, I hardly began to get a true experience. But what really impressed me was the articulated amount of theming and devotion to ambiance. 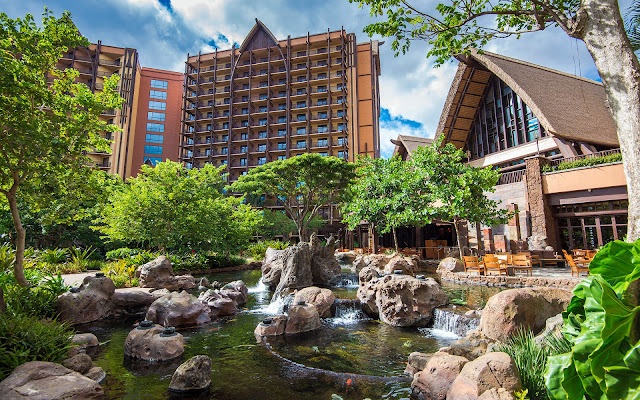 Aulani is the most artfully executed Disney hotel I have ever visited, and while I haven't seen Disney's Asia resort offerings, Aulani puts the mainland hotels to shame in its magnificence. This isn't to say that Disneyland and Disney World have poor hotels. 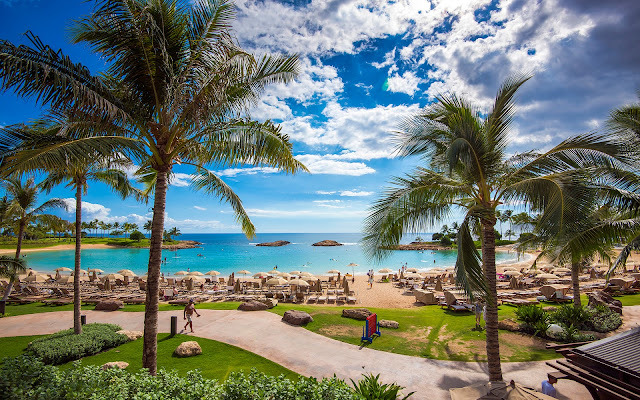 Aulani simply shines that brightly in comparison. A fountain and garden area in front of the main lobby building. So yes, I enjoyed wandering around Aulani. And like I mentioned at the beginning of this (as it turns out) long blog post, I'll be sharing more photos. This is what happens when Disney meets paradise!